My husband just got back from another long work trip in Chicagoland. It was windy (appropriately), but it was also freezing cold, as winter had set in with a menace bringing snowstorms with it, so I'd packed him off with thermal undershirts and even a few pairs of long-johns. We Skyped on a daily basis, and one day he said to me, "Hey, you know Andy's is open? How weird is that?" Andy's is a purveyor of frozen custard, which is far as I can tell is pretty much like home-made ice cream - rich and eggy with a custard base. With branches all over the Mid-west, the outlet my husband was referring to is on Church Street in Evanston. 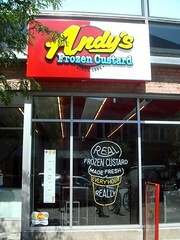 Founded in 1986 in Osage Beach, Missouri by John and Carol Kuntz (heh), Andy's particular speciality is seasonal frozen custard-based desserts. So in the Autumn, they offer pumpkin pie concretes and apple pie concretes (where whole slices of pie are blended into the frozen custard), and in the Spring and summer they offer peach cobbler and blueberry pie concretes. "Concretes" are so called after the fact that nothing will drip if you turn them upside down. 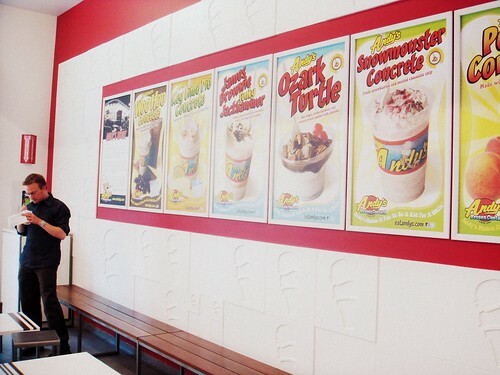 When we visited Andy's together last Summer, after a lot of dithering, I chose their best-seller, the "Ozark Turtle", and my husband went for the Key Lime Pie Concrete. 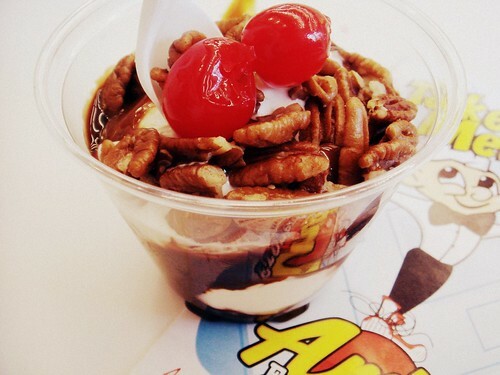 The Key Lime pie was a beauty with fat chunks of short, crumbly pastry and the tang of real limes, but the Ozark Turtle was heaven - gooey creme caramel, hot fudge, warm chocolate sauce, sweet, almost toffee-like roasted pecans and glace cherries whipped into the frozen custard. Having tasted such iced gems, I guess I can see how the need for frozen custard can hit at any time, even in the very depths of winter. Why you tease us with frozen treats we can't have? Why? 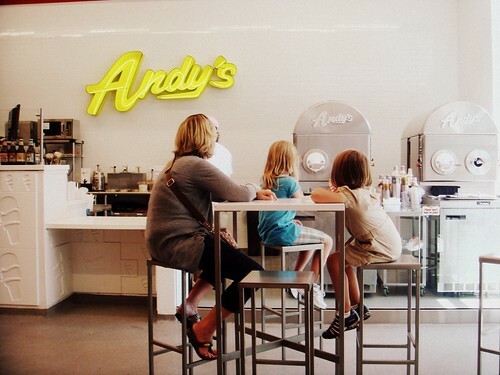 Will be putting Andy's on our list of foodie hotspots for our trip there this year! Thanks for the recommendation! Frozen treats in winter rule. I want one of these concretes, possibly only because they are called concrete. Big gooey lumps of caramel and frozen custard - what's not to like? It's one of the things I like about the US - that the chains can serve up properly tasty goodies like this. @Suzler - Knowing nothing about US politics, I'm not sure I understand your fear of the chap. @bar stools - You're welcome!